This beautiful Brooklyn home has been designed by The Brooklyn Home Company, a family-run cooperative of artists and builders committed to creating world-class and innovative living spaces in Brooklyn. I love the rustic table (image above) which has been crafted from a fallen beech tree by wood worker Fitzhugh Karol and jewelry designer Lyndsay Caleo. 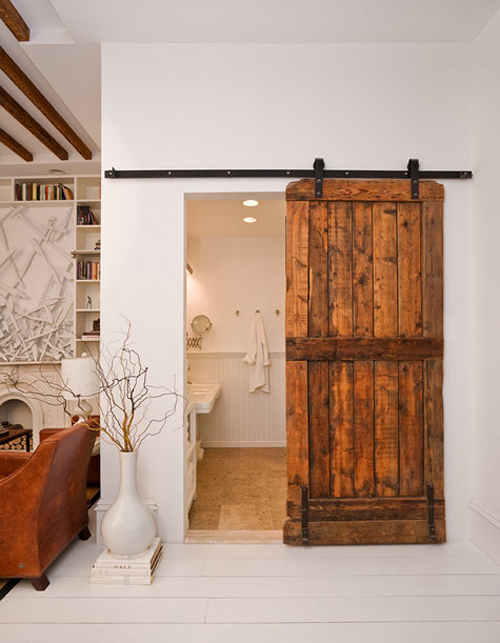 The bathroom can be found behind this gorgeous wooden sliding door. The couch platform is made from reclaimed brownstone beams and twin mattresses to accommodate for more guests. The wood sculptures and tables were made by Fitzhugh. Beautiful, I like white interiors warmed up by wood; the pantone chairs and the dining table are a hit. Loving that idea for the sofa platform! I may need to borrow that idea for my guest/office room!! love all the white & wood — my favorite combo! I never get tired of all white and wood interiors. The bookshelf is something I dream of having. What a wonderful focal point in the room. Ah, love this interior so so much. Can never tire of looking at it. I love this apartment. So cool. Mixing nice materials and some wonderful mid-century modern pieces. Stunning white interior warmed up by wood. Simply inspiring! Thanks for posting!